I read two articles tonight which caught my attention related to Safe Routes to School – right after a neighborhood bike ride home with my 17 year old nephew from his downtown Sacramento high school where I am volunteering as a mentor to students working on campus bicycle programs. The first was a tragic article in the Sacramento Bee on Michelle Murigi who was fatally injured just one week before her 17th birthday a few blocks from her high school campus. The second was on a new report released today by the National Center for Safe Routes to School on how to prevent such tragedy through ways to engage schools in increased safety measures, better infrastructure and education programs. While 40% of low income students walk to school, only 8% of high income students walk – many schools lack adequate facilities to support active transportation. (Chapel Hill, N.C.) January 24, 2012 — Do Safe Routes to School programs that increase walking and bicycling have some characteristics in common? A new report conducted by the National Center for Safe Routes to School has found that may indeed be the case. Identifying an in-school leader, often the principal, to champion SRTS. Conducting activities that reinforce walking and bicycling, such as frequent walker/biker programs and Walk to School Day events. Generating parent support for SRTS. Establishing policies that support SRTS, such as early dismissal for students who walk or bicycle home from school. 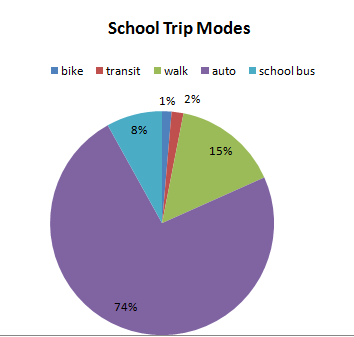 In the Shifting Modes study, National Center researchers explore how school-level dynamics that underlie planning and implementation of SRTS programs relate to the percentage of students who walk and bicycle between home and school. The National Center examined three schools with SRTS programs that measured increases in walking and bicycling to school and compared them to a sample of schools that shared similar demographics but did not increase walking or bicycling to school. To view the complete report, visit www.saferoutesinfo.org/program-tools/shifting-modes-report. Because the study was limited to schools with three years of data and only those schools that adopted SRTS programs early and met stringent data collection criteria were examined, the study’s sample is small. The student travel mode data were complemented with structured interviews with local SRTS program coordinators. This approach yielded insights into ways to increase the percentage of students who walk and bicycle to school. The National Center also developed a brief document specifically for the SRTS practitioner. Getting More Students to Walk and Bicycle: Four Elements of Successful Programs highlights how practitioners can use the study’s findings to increase student participation in walking and bicycling to school. The four key strategies identified in the Shifting Modes study are compared to two schools that have been nationally recognized for increasing walking and bicycling to school; the programs at both schools shared all four identified strategies. To view Getting More Students to Walk and Bicycle, visit www.saferoutesinfo.org/program-tools/getting-students-to-walk-and-bicycle-for-practitioners. Established in May 2006, the National Center for Safe Routes to School assists states and communities in enabling and encouraging children to safely walk and bicycle to school. The National Center serves as the information clearinghouse for the federal Safe Routes to School program with funding from the U.S. Department of Transportation Federal Highway Administration. Part of the University of North Carolina Highway Safety Research Center, the National Center also provides technical support and resources and coordinates online registration efforts for U.S. Walk to School Day and facilitates worldwide promotion and participation. For more information, visit www.saferoutesinfo.org.